This qualification is intended for those who wish to gain an understanding of the principles and practices of internal quality assurance without any requirement to practice. How does the candidate achieve this qualification? 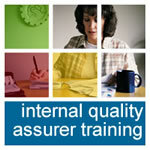 The Unit 401 is a knowledge Unit and as such, Unit 401 candidates working towards this qualification will not directly internally quality assurer but will have to demonstrate the knowledge and understanding required to prove that they know and ‘understand the internal quality assurance of assessment processes and practice’. work through the Online Learning Materials (distance learning) for this Unit. Once the training has been completed, Unit 401 candidates will have to complete an assignment to explain in detail (usually by typing in detailed responses to questions) to show that they know and understand ‘the internal quality assurance of assessment processes and practice’. This assignment can be submitted via an ePortfolio or by Paper Based Portfolio (postal submission). As this Unit is knowledge only and only requires a single assignment submission, ePortfolio is not recommended for this single knowledge Unit qualification as the cost of an ePortfolio will be disproportionate to the amount of evidence (the assignment) being submitted.